Bronze medallist at the 2012 World Women’s Boxing Championship, Kavita Chahal (+81kg) and 2010 Asian Games bronze medallist Kavita Goyat (75kg) capped off a brilliant performance as they went on to strike gold at the 4th Inter-Zonal Women’s National Boxing Championship at Visakhapatnam in Andhra Pradesh. But silver medal winner at the Asian Women boxing Championship Pinki Jangra (51kg) and reigning Junior World Boxing Champion Lalenkawali (48kg) had to settle for a silver medal after losing out in the championship round. Kavita Chahal playing for the North Zone was the lone medal winner from India at the World Championships earlier this year. She continued her good run at Inter-zonals as well, hardly breaking a sweat to successfully defend her title. Up against Neha Jadhav, representing Central Zone, the super heavy weight boxer started off slow, but quickly gathered pace to make it a two point game after the first two rounds of play (4:2). With the help of some heavy hitting body blows and combinations, the Haryana girl kept adding to her advantage, not giving Jadhav many opportunities to score. In the end she went on to win the yellow metal with a score of 11:4. “I am happy with my performance here; it was a good tournament for me as I fought well throughout the championship. Playing and doing well in the domestic tournaments really helps one maintain a good rhythm and keep match fit and that’s why it’s important to keep participating in such events”, expressed Chahal after her medal winning bout. The finals of the middle weight division and Kavita Goyat of Haryana displayed her mastery in the craft with a superlative performance against Raman Deep Kaur of the IABF ‘B’ team. Kaur had no answer to the offensive onslaught of Goyat; the 22 year old was relentless with her short jabs and destructive combinations and soon amassed a big lead. She eventually won the gold with a huge margin of 32 points. Silver medallist at the 6th Asian Women Championship Sonia Lather of the North Zone notched up a similar victory against Shivani Dahiya of Central Zone to win the title in the bantam weight division. In the welter weight category, 2011 Asia cup bronze medallist Neetu Chahal playing for the North Zone edged past Seema of the West Zone with consummate ease to clinch the gold. National Games gold medallist Vanlal Duati of Mizoram, standing in for the North East Zone, got the better of Pinki Jangra, in what was a fight to the finish. After the opening two minutes of play, both boxers, who adopted a cautious approach, were level with a point each. But with the beginning of the second round Duati, slowly but steadily started to build on her lead. The Mizo boxer, who was leading 4:2, warded off a strong comeback from Jangra, in the final round, to claim the fly weight gold with a 6:5 victory on points.Multiple gold medal winner at the junior nationals Lalenkawali representing the IABF ‘B’ team had a bad at office against North Zone boxer Mamta in the finals of the light fly weight class. 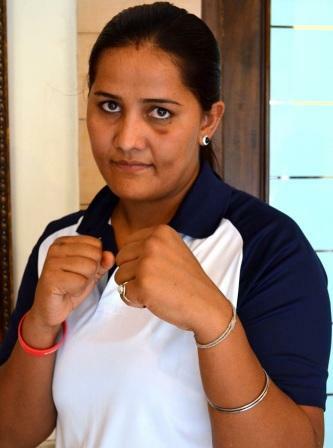 Lalenkawali, who had been in great touch up till now, was completely out of sorts against the heavy hitting and superior ring movement of the Haryana girl. She was trailing throughout the bout and by the third round Mamta had opened up a huge gap (6:15). She finally lost 10:21 and had to settle for a silver medal. North Zone bagged the top honours with 7 gold medals, 1 silver and 1 bronze, a distant second was Central Zone with 2 gold medals, 1 silver and 3 bronze medals. Kindly visit IABF official website www.indiaboxing.com for complete championship results.